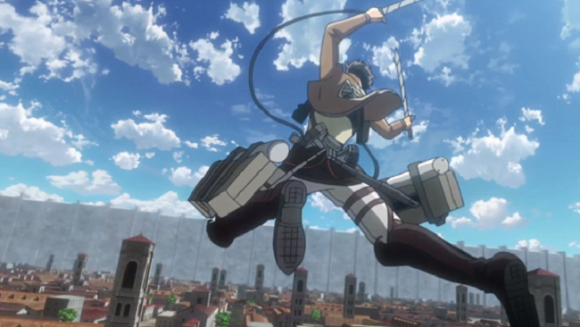 Attack on Titan (Shingeki no Kyojin) is home to Titans that possess extreme physical attributes. This doesn't mean that humanity is defenseless though. 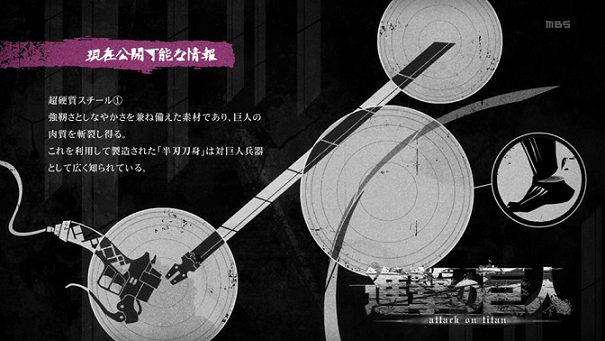 Let's talk about the most important equipment at humanity's disposal in the battle between humans and Titans―3D Maneuver Gear! Humans and Titans have various physiological differences. The most important one that defines the conflict between them is the vast disparity in physical stature between the two races. 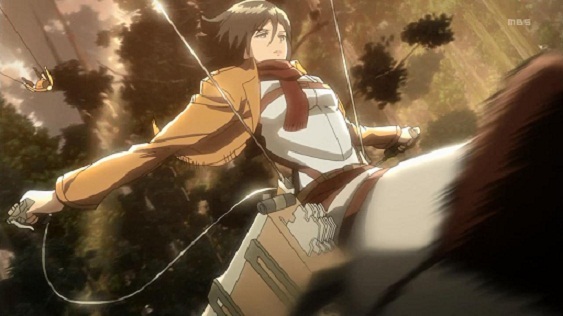 Even the smallest of Titans appear to be at least three times the height of an average human, with the largest of them being somewhere in the range of twenty times their size. 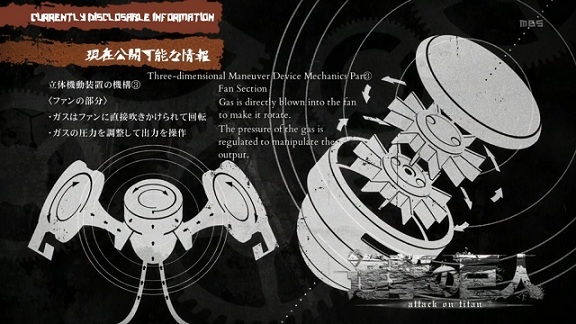 The 3D Maneuver Gear is essential in humanity's struggle against the Titans. It provides humans with an extra dimension of movement. Proficiency in the use of the 3D Maneuver Gear allows users to dance through the air with a freedom of mobility normally reserved for birds in flight. A skilled user of the 3D Maneuver Gear can draw on vastly augmented agility and speed, allowing for increased avenues of offense and retreat. It also helps to close the huge size gap between humans and Titans, as it allows users to traverse both heights and large distances at will. The key to the gear's vertical ascension is a gas-powered mechanism attached to the harness near the base of the user's spine. Pressurized gas is injected directly into this mechanism and spinning fans generate the momentum required for continuous lift or travel in different directions. To achieve this, canisters are loaded with the necessary gas. Users must regulate their gas consumption in order to remain combat-effective for as long as possible, since reloading is not always possible. Long, fine, steel cables equipped with grappling hooks allow users to direct their train of flight. As its principal design function is to allow users to swing and propel themselves through the air by reeling the cables in towards the fixed points designated by the grappling hooks, the 3D Maneuver Gear is suitable for use in environments where there are plenty of targets to swing from, like cities and forests. Other than the grappling hook system, control of the 3D Maneuver Gear is maintained through the equipment of the full-body harness. Through the harness, users are able to control the trajectory of their flight through shifting their body weight. The harness comprises of a complex collection of straps and joints, such that even merely positioning the body upright requires enormous physical control, balance, and mental fortitude. The final component of this Titan-slaying equipment is the weapons aspect. Users of the 3D Maneuver Gear utilize grips in either hand with the built-in triggers. Aside from these grips themselves forming the sword-hilts for the detachable hardened steel blades the soldiers carry, the triggers also control the firing mechanism of the grappling hooks, along with the release of the pressurized gas to regulate the user's speed of travel. Which anime armor will reign supreme? Come and get to know the best candidates for the title and decide which one should take the glory. Put on your helmets and prepare for the explosions. This is a collection of the 20 best war anime from the thrilling 2D battlefield! So what exactly separates them from the rest? Explosions? Drama? Political intrigue? You name it, they've got it.